It's a strange world we live in where it's considered inappropriate to call without texting first. Isn't placing unannounced calls exactly what phones are for? I remember the days where I could call my friends or even prospects out of the blue and it was totally fine. Regardless, the phone is often still your first touch point with prospects and their first impression of you. No one knows better how to capitalize on the opportunity of the inbound phone call than Jill Nelson. Jill is the Founder and CEO of Ruby Receptionists and my guest for this episode. She is an award-winning businesswoman who started Ruby in 2003 and had scaled it to a thriving company with over 500 staff achieving double-digit growth every year since its inception. She offers virtual receptionist services to business owners and so far, her army of 400 receptionists have answered 50 million phone calls. 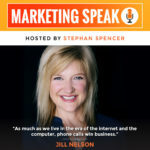 If you care about customer experience, then you'll absolutely want to hear what Jill has to say in this wide-ranging conversation. 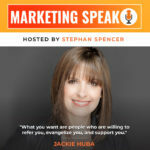 She reveals her secrets to mastering the prospect’s first impression, how to wow customers and her secrets to the perfect phone script. 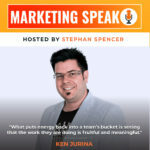 In this episode, we are going to peel back the curtain on marketing agencies, learning about how they handle scope creep, attribution and misattribution of their efforts, setting and resetting client expectations, retainers, performance-based pricing, leading and lagging metrics, dashboards, negative keywords, and a lot more. This episode is a success story 25 years in the making. Our guest is Ken Jurina. He founded his company, Top Draw, in 1993. In the early days, Top Draw was a humble graphic design agency and he was the sole employee. When he realized he was going to face some pretty stiff competition in the graphic design space, he knew he needed to differentiate himself. That is when he recognized that the internet represented a massive opportunity to grow his business. Fast forward 25 years, Top Draw is now a fully integrated digital marketing agency with dozens of employees and an impressive client list. These days, Ken is focused on business development and SEO which he has had the foresight to realize would give him a massive advantage over his competitors back in the ‘90s. Ken was also Cofounder and Cochair of the Canadian Search Engine Marketing Professional Organization, which establishes and promotes ethical internet marketing practices and guidelines in Canada. It is a meeting of two OGs. 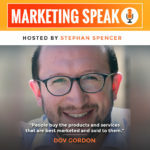 That is SEO and digital marketing veterans for those of you not familiar with the jargon on this episode on Marketing Speak. If you are in the mood for a masterclass, keep reading because you are about to read some tips and secrets drawn from years of blood, sweat and tears. Would you like to learn how to encourage word-of-mouth systematically? If so, you're in the right place. This is episode number 156. 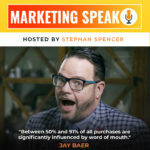 Our guest is Jay Baer. Jay's been on the show already on Episode 78. We talked about Hug Your Haters. He is President of the global marketing consultancy, Convince & Convert, a Hall of Fame Keynote Speaker and Cohost of the Social Pros Podcast. There are millions of consultants, coaches and professional service owners who love their work and yet they struggle. All they want is a consistent flow of great clients and yet that alludes them. There is a solution. It’s a simple, repeatable client-getting system that best fits you and your strengths. Our guest who will teach this to you is Dov Gordon. Dov is the Founder of The Alchemist Entrepreneur. He’s an expert at helping companies attain a consistent flow of their ideal clients.